There are many polyhedrons that are round enough to be suitable for making spheres out of much like a segmented woodturning, or they can of course be finished as flat-sided polyhedrons. There are already some examples of polyhedrons made into spheres by others that can be found, but not very many. I have pictures of some of the pieces I have made shown below. Most people would assume that the spheres require a lathe, but they do not. Here is a short video I made showing how I round the polyhedron faces individually using a simple jig I made for a table saw. This method is capable of producing large spheres. Each piece would be rounded individually before being assembled into a sphere. The part being rounded in this video is one of sixty pieces for a Strombic Hexecontahedron with a finished size of ten inches in diameter. In hindsight I should have waited on curving the faces because they inevitably had a very small step at each edge joint. I now know that it works better to round all the faces together after the assembly. Curly maple pentagonal hexecontahedron. I wanted to see if it would be difficult to put the polyhedron directly on the lathe with flat faces. It was a little off center, but turned out good. Even after I got the whole thing rounded it was still off balance because the inside is still off center and I didn't want to attempt turning the inside. I don't have the appropriate hollowing tools, and I didn't want to put a hole in it to access the interior. The completed sphere, ten inches in diameter. I thought it would look better with some contrasting wood instead of one solid color so I put some stripes in the next one I made. Red oak and walnut sphere. The polyhedron used for this sphere is different than the one pictured above, they both have 60 sides and are classified as "Catalan Solids". This group of polyhedrons are particularly well suited for this kind of construction because all of the bevel angles on each edge are the same. This sphere is ten inches in diameter. A look at the inside during construction. How do you like those angles? The narrow strips you see are walnut and will become exposed later after rounding the surface with the jig as shown in the video near the top of this page. Gluing together a more complex polyhedron with the faces made of endgrain red cedar. This shape has 62 sides, and five different bevel angles in it's construction - testing my skill here. If you have the program "Great Stella", you can make this polyhedron as the dual to a frequency 1 geodesic sphere based on a pentagonal icositetrahedron. The parts are taped together with masking tape and then wrapped with stretch wrap - tape alone tends to loosen up after a little while. The stretch wrap holds everything tightly in place. The parts are removed one face at a time cutting through the plastic and peeling back the tape. A few edges at a time are glued to adjacent faces and then the tape is put back and marked to indicate the edge has been glued. The parts are held together for a minute or so as the glue takes hold. The stretch wrap is replaced a few times during the gluing process to keep everything together tight. 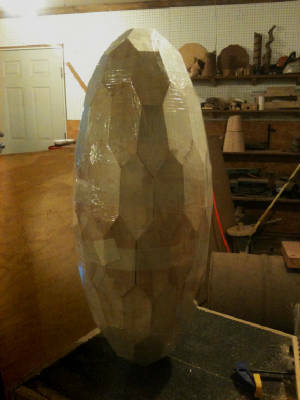 This plywood model is based on a strombic hexecontahedron that has been squashed along the 5-fold axis. The models can also be made that are stretched into a tall egg-like shape, or even shrank / stretched on more than one axis. Lots of interesting new possibilities for a segmented turning. The plastic coating is stretch wrap that keeps all the parts pulled together tight. My method is no longer limited to just spheres. I built this plywood model of a stretched sphere to verify that the dimensions and angles worked - they do. The polyhedron has 92 sides, and is based on the dual of a frequency 3 geodesic icosahedron. The model is 25 inches tall and 10 inches in diameter. A polyhedron like this could make a very interesting segmented vase.